Vintage or timeless? 1962 or 2012? Does anyone else think this style is as current and wearable today as it might have been when the pattern was issued? I am really happy with this dress, and ready to sew it up again in a modern fabric. 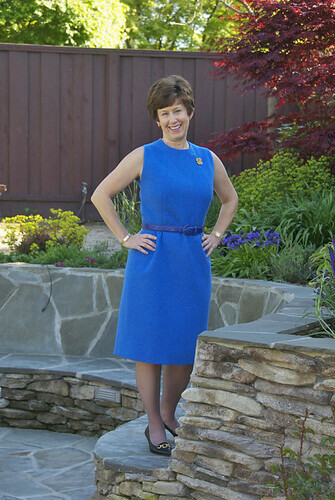 Yesterday's post has the details on this McCalls pattern and the fabric. All finished in time to take some outdoor photos, with coordinating blue flowers in the background landscape, a happy coincidence. Full length view, I think if I remake I will shorten the skirt a bit (I was going for the vintage hem length here) and perhaps taper the bottom of the skirt toward the hem. Now, promise not to laugh. 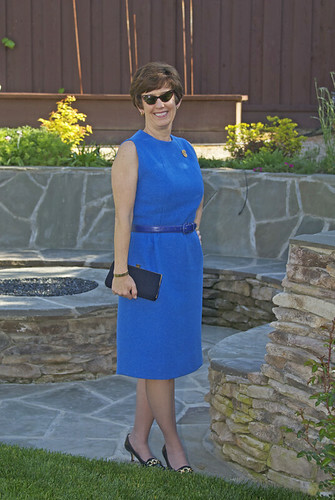 Full on retro look, vintage purse, pointed-toe shoes, and sunglasses that are about 60 years old. As I have mentioned before, there are a few of us in my family who are of the "keep that, you may need it sometime" variety, so I have some oddball things tucked away which turn out to be just right for a retro photoshoot. Those sunglasses have been in my dresser drawer for years, and this is the first time they have seen the sunshine in years. The pin belonged to my grandmother, and I really love it however I hardly ever wear it because it is real gems and gold - I am afraid I will pin it on a coat and then lose it, so it stays in the dresser as well. Tomorrow I will take some photos of the dress on the form so you can see the bodice seaming, as well as my version of a hand picked zipper - nice for a vintage detail, but I am glad someone invented invisible zips! 4/14/12, some additional photos on dress form. As mentioned in the comments, now that it is finished and photographed, I think I will shorten a few inches and take in the skirt a bit. Designed in 1962 and wearable in 2012! Does that prove there is nothing new in fashion? 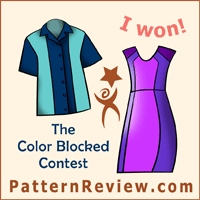 My entry in the Pattern Review Vintage contest is here . Time to return to current sewing. I still have to finish my Vogue 1143 outfit, and I am getting close. I think I did 5 muslins on pants (not my favorite thing to make) and have finally found a version that will work. Get going Beth, finish that suit so you can wear it! A cute dress and that color is great on you, Beth! Those glasses are a scream! The dress and color fits you very well! I like this dress, but I think bottom should be little bit shorter. And the dress is just right for 2012 :) Happy wearing! Beautiful! I love that colour, too. It's one I've never really worked with but when I see it on others I always think how nice it is. Can't wait to see the insides! You are beautiful in blue! I adore this color and style on you, very chic! Gorgeous colour and I love the pattern. I also like the style of your garden - I love dry stone walls!!! How pretty. 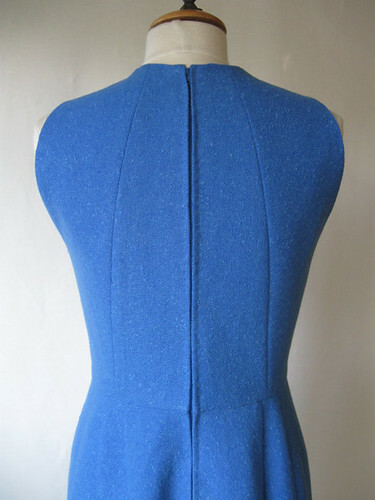 The armhole is a beautiful shape. I love the sunnies too. 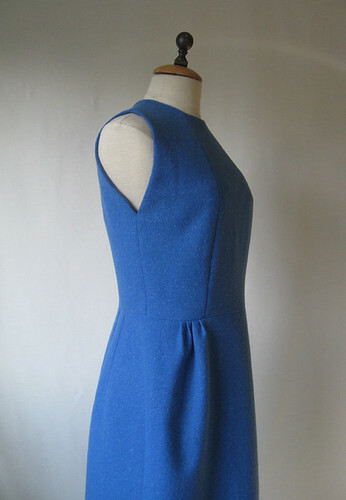 It's definitely a timeless dress, I love the bodice seaming and the colour is gorgeous! Yes, classic and timeless. 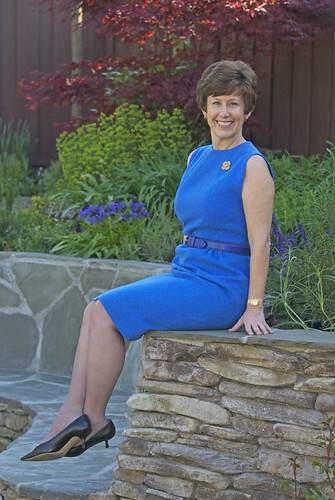 I wore that dress in the 60s and yet it is still in style. Very pretty. This is gorgeous! I just love the lines on that, and you got a perfect fit. A real gold and gemstone pin--I can't imagine! I love broaches and have many, but all costume jewelry. I vote timeless! It's so chic and very Mad Men. I love this colour on you too! Both! It looks totally modern and then so vintage when styled with the vintage accessories, especially the glasses. Gorgeous color and the fit is fantastic. 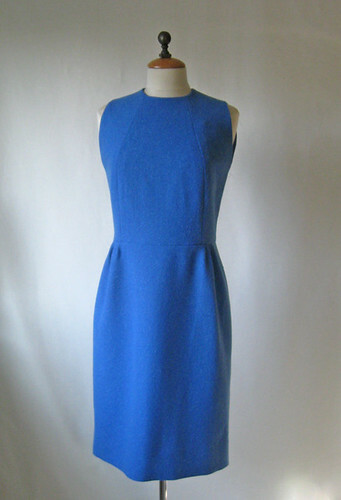 A sheath dress is definitely lovely and timeless! I agree, that color looks great on you. You always sew so wonderfully - you inspire me. And those sunnies are FABULOUS. The 60's style photo reminds me (and I so don't know your political inclinations, I hope you don't take this the wrong way) of something Laura Bush might wear. See her style a brown dress with thin belt and brooch at http://minnesota.publicradio.org/display/web/2008/11/10/obama_tours_white_house/, the photo captioned "Barack and Michelle Obama at the White House." What a gorgeous dress! The color is stunning on you and the style is simple yet elegant. Thank you for the dress form shots that show the seaming details. I love the way you retro-styled it! I remember pictures of my grandmother and her friends with those cat-eye sunglasses -- too fun! Wow! Your dress is fabulous. I love the color and all the details. I'm not sure I've seen an armhole with a point at the bottom. I think I like that feature, and the way the seams go up to the collar is also interesting. Great job and beautiful work, as always! Beautiful dress Beth. I love the lines of this dress and with those princess seams, you can get a great fit. Timeless, and so in style right now. 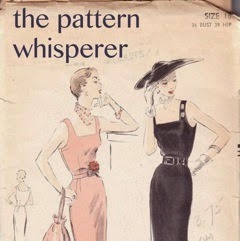 Now I'm off to search for this pattern. :) Thanks. Love it! As a professional tailor, I would be careful about tapering the skirt, though. too much of a taper can emphasize the hips, and not in a good way! It looks perfect the way it is...what is the fabric? Thank you for your lovely comment on my Mum's kimono and I will be sure to pass your kind words along. She will be thrilled to have received so many compliments!